The conventional rod and reel combo we recommend for jigging striped bass features a 7′ fast to extra-fast rod and a reel a fast retrieve that is capable of handling 30lb braid. This is a very versatile conventional outfit and is perfect for nearly all striper diamond jigging applications. 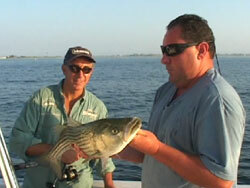 The rod must be fast so that the anglers efforts lifting the rod are transmitted to the jig. The reel needs to have at least a 6:1 gear ratio and no levelwind. The fast retrieve allows the angler to impart additional action to the jig. Though a levelwind is convenient, it acts to reduce the sink-rate of the jig (undesirable). Star drag reels are preferred because of the ease with which they can be put in and out of gear. We recommend loading the reel with 30lb braid. Braided line is preferred over mono because the thin line diameter allows for the fastest sinking action and a more vertical presentation (critical). The lack of stretch ensures that the anglers efforts are transmitted directly to the jig. The braided line is attached to 4ft length of 50-80lb fluorocarbon leader using a 75lb barrel swivel. A 2inch dropper loop should be tied in the middle of the leader. The dropper loop is passed through the eye of a 7/0 beak bait-holder style hook. A soft plastic bait should be threaded onto the hook until the hook eye was covered. The rig is topped off with either a 4oz or 6oz hammered chrome diamond jig. The best jigs have the highest width to length ratios. These “flatter” jigs have a much better fluttering action.